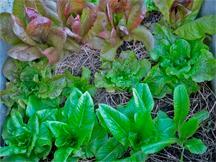 Lettuce (Lactuca sativa) is a cool season crop that is often overlooked when gardeners plant their vegetables. It is readily available at supermarkets and lacks the cachet that a homegrown tomato or melon delivers. However, lettuce is my most important crop, because I am a salad lover and nothing beats a salad made with an ever-changing variety of lettuce picked young and fresh from the garden. After a couple of years of watching my winter lettuce succumb not to cold (lettuce can withstand low temperatures - mine have survived mid-20’s in years past) but to battering rain and wind, I decided that if I was going to be able to harvest lettuce reliably all winter that I needed to devise some kind of protection. First I tried floating row covers draped over arches of flexible irrigation tubing. I weighted the row covers down with stones so that they didn’t blow away. However, picking the lettuce was problematic; I had to move the stones and ferret around underneath the cover. The fabric took the beating that formerly had been endured by the lettuce, and it began to tear and fray after only a season. So I then did what I should have done initially: I started growing lettuce in a cold frame and the results have been fantastic. The internet is full of sites that explain how to build a simple cold frame. A typical cold frame has walls roughly 12-18” high with a hinged, angled (lower in front) glass lid that is often made out of an old window or door that can be propped up for ventilation. It can be as large or small as you want it, making it an ideal structure for suburban backyards short on space. 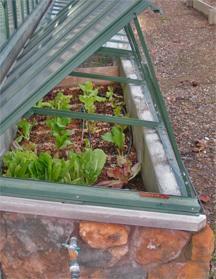 Cold frame kits are also available from garden supply companies; I built mine onto my greenhouse. 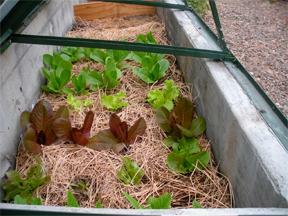 Cold frames can also be made of PVC pipe and clear plastic, or bricks or even water-filled plastic bottles! You should site your cold frame facing south for maximum sunlight and warmth. Mine is about 2 1/2 ‘ X 6’, faces Southeast and has the greenhouse structure on its Northwest side. Once you have your cold frame assembled and sited, either set it on top of the ground or bury it halfway or so for better insulation, and fill it with about 8” of rich soil mix. As with containers or raised beds, you will need to replenish the soil or amend it frequently with compost. I now grow lettuce in my cold frame year round, as I discovered that the greenhouse on the Northwest side protects the cold frame from the harsh afternoon summer sun, which produces a superior crop. I generally leave the lid propped open about 10”, as it is horizontal enough to protect the lettuce from the rain, and allows for much better air circulation than when it is closed. Also, when the lid is closed you have to be mindful of sunny winter days when the temperature inside a closed cold frame can get high enough to scorch the lettuce! Mascara, Flame, Lolo Bionda, Little Gem, Oak Leaf, Petite Rouge and Tom Thumb. My salads are crisp, colorful and incredibly flavorful, and I have the satisfaction of growing food right through the winter!